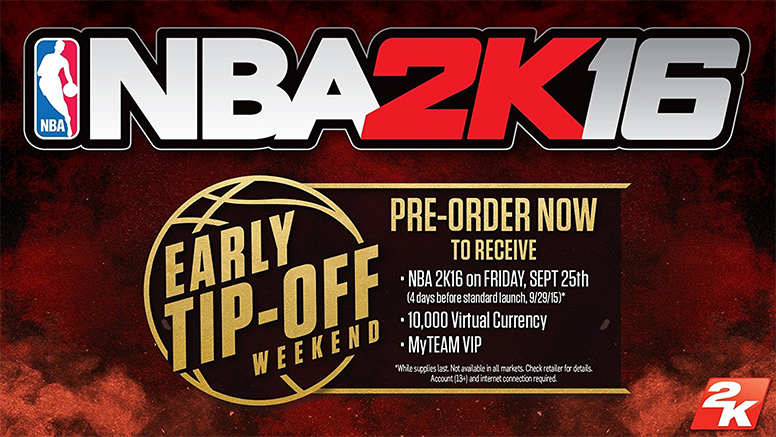 With the NBA 2K16 launch looming, we know that you're likely overwhelmed with choices and information about pre-order details. In an effort to streamline things, we wanted to provide you with a detailed, easy-to-understand breakdown of all the different pre-order options and bonus content provided therein. The game will be officially released on September 29, 2015. Pre-ordering will grant early access for both the regular edition and the Michael Jordan Special Edition. MyTeam VIP — 3 Emerald Packs with a guaranteed Emerald player in each pack. The 35,000 VC immediate bonus for NBA 2K15 will not be available to European customers. The VC bonuses mentioned below will only be granted if your copies of both NBA 2K16 and NBA 2K15 are registered under the same account (for PC) and platform (for consoles).